The ways of mother nature are incredible.. Even after years and years of gardening and sowing seeds it still amazes me how a tiny seed or cutting can sprout into a massive form of beauty! 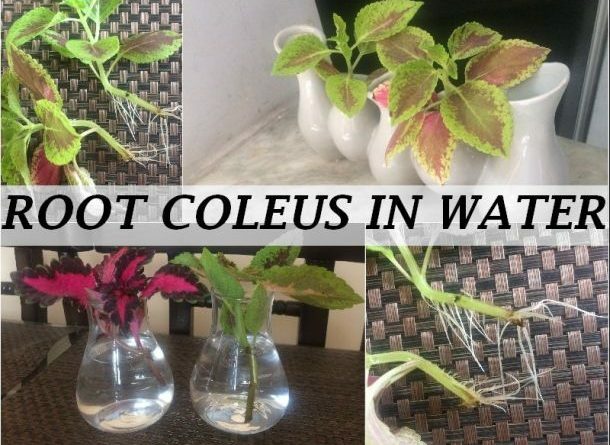 I do not know why but i get a particular thrill from growing coleus cuttings in water. 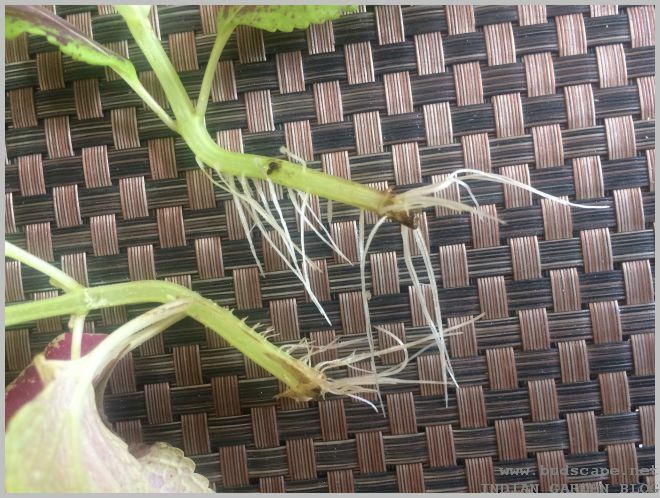 It is just so easy and incredible to watch that sometimes i just snip off a cutting to root in water.. just that like. Of-course, the extra plant is an additional delight for the garden. 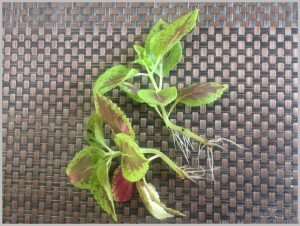 Coleus is perhaps the most wonderful addition to a summer garden. Easy to grow and low-maintenance, the burst of colors it brings to a garden is almost unbeatable! 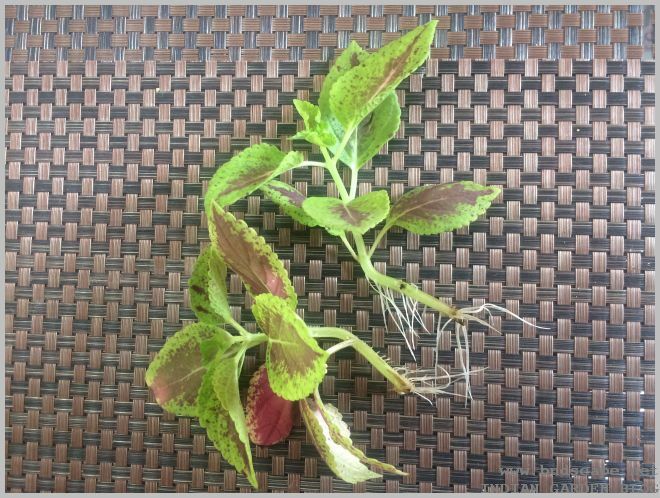 Unlike flowers, where you need to wait for blooms for a splash of color, coleus is instant! Propagating Coleus in water – Super easy & fun! Mine actually happened unintentionally and then i got hooked onto it! So from the plant growing in my garden, i’d brought some clippings indoors for a flower vase in our kitchen. Then, we left for Diwali holidays and i came back to discover the cuttings as fresh as ever unlike the wilted roses next to them. I had a hunch that they might have rooted while sitting in water and look what i discovered.. Indeed!! Being a soft stem plant it sprouted roots easily and quickly! 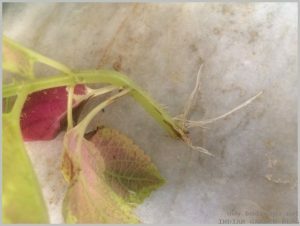 I do feel that it is easier to root plant cuttings in water than doing so in soil because you don’t have to worry about the cuttings wilting with lack of water or drying up from the direct sun outdoors. Notice the size of the roots.. 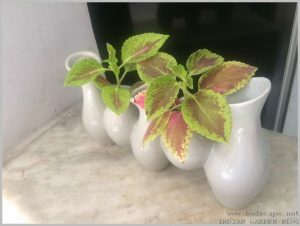 It is the best to propagate a coleus cutting in water instead of soil as it quite fail-proof. I love the thrill of rooting plants in water having experimented with portulaca, tulsi, geranium and coleus! 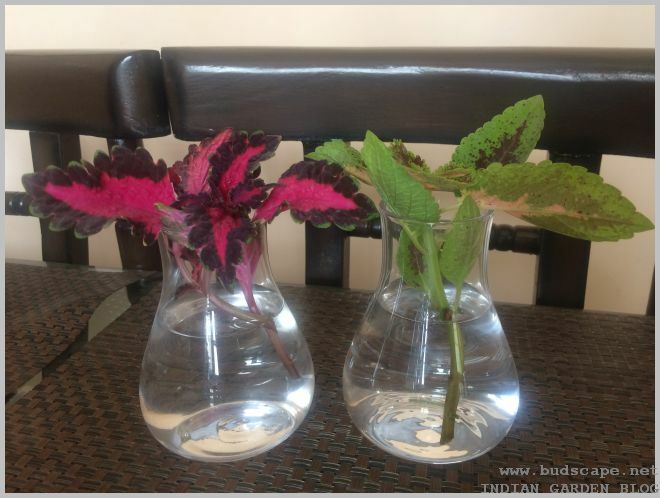 I think i am now going to plant some clippings in the small transparent vases on our dining table and capture the process. Also, i am curious to see how long they survive indoors. Stay updated if you are curious too!